Have you lost the desire to clean; is your cleaning schedule too difficult or just doesn’t fit with your current situation and is just not possible to follow? Don’t despair, you can tackle your cleaning regime and get it back in order in no time. It is a lot easier than you might think and is less stressful than worrying about all the jobs you have forgotten to do. It is easy to follow a schedule or a cleaning plan that works; however, as life changes so, too, do the routines and the schedules, which will work. It is important to know that when a cleaning schedule stops working, it is OK to change it to meet your current needs. For a cleaning schedule to work you must have an effortless system, one that fits in with your life and not fight against you, making you feel self-doubt and an inability to keep your house clean. Throw away your old cleaning schedule and try to see what and how you can fit in cleaning into your current situation. It is overwhelming when you are trying to fit in cleaning and it just doesn’t work, you spend more time worrying about the jobs you are not doing, instead of focusing on what you can do. Don’t worry about finding a new cleaning schedule, just find 5 minutes maximum and do a quick tidy through. It will make you feel better and you can then use these short bursts of time to clean your home and find a schedule that suits you. There are normally two reasons why you are struggling with throwing away your old schedule and finding something that will meet the needs of your family; the first is procrastination, where you keep putting off the tasks in hand, they might overwhelm you and you might think they are going to take longer than they will. The second is looking for perfectionism, how often have you heard the saying ‘if you are not going to do it right, don’t do it at all’, for many years I thought this was sound advice, my home was always perfect and I did the jobs my way. Unfortunately, I couldn’t see that other people were trying to help, they were just doing it wrong (in my eyes) and making more work for me. It has taken me a long time to accept other people’s help and being thankful for the work they have done, it mightn’t be the standard I like, but that doesn’t matter, they have helped and that is the most important point to realise. If you struggle with procrastination then you have to fight it, set a timer and just aim to do small amounts of work and you will see the results which will urge you to continue, you might even be surprised how much you can get done in a short space of time. While there are many cleaning schedules that get completed ready for use and planned out, unless you find one that suits your needs then you might just try using a blank schedule and fill the tasks out that meet your own needs. It doesn’t matter if it is not perfect and as long as you are happy with your home then your cleaning schedule is working. 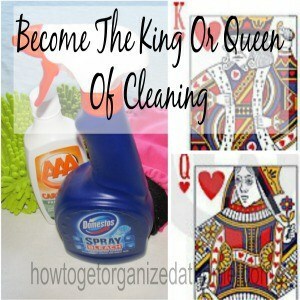 Therefore, becoming the king or queen of cleaning is about finding the right routines for you and the correct balance to fit in the tasks in the time you have available. I love that you mention the barriers in cleaning. Often only the tips are mentioned. It’s great that you actually suggest to step back and find what works for the individual! Thank you Emily for your kind words! There is nothing worse than trying to make a cleaning routine fit!